Police in San Bernardino, California, released pictures of two suspects in the abduction of a 3-year-old boy who was taken at gunpoint from his home last weekend. Briant Rodriguez has been missing since May 3, when two Hispanic males armed with handguns burst into the home, tied him up, along with his mother and four siblings. They ransacked the home before leaving with Briant, a small amount of cash and some personal property, San Bernardino County Sheriff’s Public Information Officer Cindy Beavers said. A motive for the abduction is still unclear, and the authorities have not received a demand for ransom, Beavers said. Investigators traced samples of the tape used to tie up the family to a home improvement store where they believe the suspects purchased the tape the Friday before the abduction. The unidentified store’s surveillance camera captured two men who matched the description of the kidnappers given by Briant’s mother, purchasing tape believed to have been used in the abduction, Beavers said. The home improvement store’s exterior surveillance cameras also caught a green Ford Bronco believed to have been used in the abduction, Beavers said. The same car was later seen driving past a convenience store near Briant’s home about three minutes after his mother called police on Sunday to report the abduction, Beavers said. Authorities distributed screen grabs of the footage on Friday showing the suspects and the vehicle in an effort to draw more tips, which have been coming in steadily since an Amber Alert was issued earlier this week. “You’ve got two men that resemble the description given by Briant’s mother, they’re buying tape that matches the tape used to tie them up, then they leave the store in this green Bronco and then on Sunday, just a few minutes before the emergency call for help, the same vehicle is seen leaving the victims’ neighborhood,” she said. “Detectives put these two incidents together, and they’re confident that these are the suspects and that was the vehicle used,” she said. Both suspected kidnappers are Hispanic males — one 5-feet, 5 inches tall, between the ages of 18 and 20 with a thin build, unknown hair and eye color, last seen wearing a black baseball hat, blue jeans and green T-shirt. The other is 5-foot-10, around age 24 with a thin build, black boots, a black shirt and a bandanna. Neighboring law enforcement agencies are on alert, and the FBI, Immigration and Customs Enforcement and the U.S. Border Patrol are assisting in the investigation. 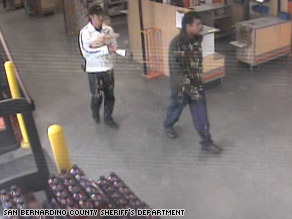 The FBI and the San Bernardino County Sheriff’s Department have both put up $25,000 rewards for Briant’s return. The FBI has also established a Facebook page with the latest information in the case. “We became involved in the beginning and that’s customary in kidnapping cases because of the potential for cases to go out of state or out of the country,” FBI Spokeswoman Laura Eimiller said. Despite early speculation that the abduction was related to Mexican cartel violence, both spokeswomen said they were unaware of specific evidence suggesting the family had ties to the drug trade. “We’ve seen an escalation nationwide in south-of-the-border-related kidnappings, whether it be drug cartels exacting revenge or carrying out violence in exchange for drug debts, or in another type of scenario, Americans who do business in Mexico being targeted for ransom,” Eimiller said. “Of course that’s being looked at as a scenario here, but we have no conclusive evidence suggesting that’s the case just yet.” Briant is described in the Amber Alert as a Hispanic male who was last seen wearing a yellow shirt with blue sleeves and blue-striped shorts with two different colors of blue. The boy’s hair is longer than shoulder length.